When I was a little girl I loved Rainbow Brite! I wanted to be her and ride around on her flying horse Starlite and conquer the bad guys in order to keep the world bright and colorful. While I didn't plan my outfit to resemble my childhood favorite I couldn't help but notice a slight resemblance. I like to think this is the grown up version of Rainbow Bright with a little more style. seriously so adorable! Love the shoes! love the bracelets! and love the romper! This is crazy cute! Love the bracelets too! fantastic colours! i like your hair plaited too.. This is a great outfit.. Simple yet so strong!! Great romper but the shoes are gorgeous! L O V E the look!!! this whole outfit just screams GENIUS! i love all the lements of this outfit..the romper, the clutch, the shoes, the colorful bands, the watch, the hair!!! it's just too much! haha! great outfit! love your pics, as usual! This is absolutely stunning and vibrant. I love the romper with those snakeskin pumps. ***And I hope you watched a youtube video of Joel McHale as Rainbow Bright. I really dig the way you broke up the brightness and otherwise uniformity of the romper with that great, skinny belt! The punchy colours in your jewelry really does make this a more stylized and grown-up version of Rainbow Bright. You did a seriously great job making a sophisticated yet fun look here! Taylor, I LOVE this! So cute & fun! That romper fits you perfectly! & I had a stuffed doll of Starlite! My sister had Rainbow Brite, and I had her pony! Too funny. Love the bright red romper! I loved Rainbow Bright growing up, too! I think you've done well transitioning her non-adult look into adult territory! Great romper! Love the bright red. I can totally see you as a rainbow bright girl. Ha! This explains so much! Love those shoes! Love this romper! I love it even more paired with those shoes!!! Stunning! such a fan of red/yellow combos! this looks great! I totally love your bright orange romper! Oooh, love the red & those bracelets are so fun! That is one sassy romper! Love the look, the colours, the accessories...perfection. FUN...love the bracelets and shoes! You look awesome! So pretty and bright! Love the bracelets and shoes are fab! I LOVE that color! So bright and cheery! cutest romper ever!!!!! if it was a dress id buy it immediately ! i love the bright colors of this outfit!! This little playsuit looks so nice on u! Makes ur sporty legs come out quiet well! That romper is absolutely lovely. The colour is amazing!! I couldn't agree with you more, love it and the shoes really balance out the color nicely! You look AMAZING! Love how the shoes dress up teh romper. And can we talk about how you have the best legs ever! That is an awesome romper! You look fabulous! I love it all. Taylor, I LOVE this bright long-sleeved romper! So cute. And your legs do look out-of-control! This romper is to die for! This is probably one of the best rompers I've ever seen. I love the bright color. Girl, you look STUNNING! This has got to be one of my fave looks of yours so far! I adored Rainbow Bright and my favorite color is red so of course I love your posting. You look awesome and can't believe the shoes are nine west! Red is amazing on you!! I love the rainbow accents but that the look is mostly monochromatic! Beautiful! Loving those heels and jewelry! The friendship bracelets are a cute mix with the watch. This outfit is AMAZING. You look so skinny and fit! I love all of the colors and the Rainbow Bright reference! Too cute. LOVE the shoes? Were those a recent style from Nine West? Just gorgeous Taylor, love this entire look! Those shoes are ah-mazing too! Gorgeous! 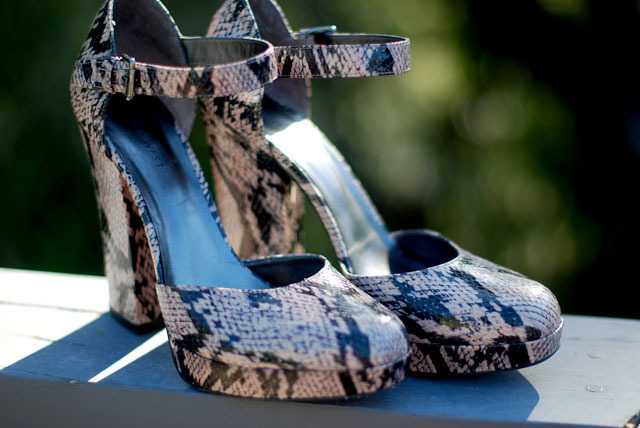 Snakeskin shoes are absolutely a weakness for me! this is such a fun outfit taylor! i love rompers, i wish i wore them more but they're so "tricky" to wear compared to other things. you pull it off beautifully! Between your posts and GG, I've become a bright fanatic. Love these colors, especially Lauren's bracelets! Such an amazing look, I love it! SO gorgeous! love the neon bracelets. Beautiful outfit! did u make those bracelets that you're wearing? ?